If your HVAC system isn't clean, your lungs are the filter. Indoor Air Quality has been linked over the years to such office maladies as “Sick Building Syndrome” (SBS) and other issues that interfere with the day-to-day work of you and your employees. This is due to VOC (volatile organic carbons) that are slowly off-gassed from the products used to build most office buildings and was a huge issue in the 80’s before they came to the obvious solution that you shouldn’t be cooped up in an office building all day and if you are then the building must be properly fitted with a well-maintained HVAC system, proper outside ventilation, and what NASA found most important in most cases was the presence of indoor plants (1). While this may serve to be an immediate answer for sick building syndrome, there are other forces at play here as well. NASA found that plants helped purify the indoor air by phytoremediation, but what about the damp settled dust that never makes it out of the evaporator coil or drip pan? This air could be purified, but to what use if the source pollution isn’t taken care of? As we’ve stated before, the ubiquitous nature of microbes allows their proliferation in any environment that supports their growth. These critters, while small, do induce corrosion and expel bio-products that can affect air quality and building material integrity if left unchecked for long enough. Here’s what happens: a layer of dust has formed in your A/C ducts upon which aerobic bacteria form. Not a huge issue in itself but if not dealt with, that aerobic bacteria forms a biofilm which creates a micro-environment where oxygen is used up and only anoxic bacteria can exist at the metal-biofilm surface. These organisms are creating energy to stay alive by using the metal as a Terminal Electron Acceptor for their electron transport chain and therefore change the very surface of the metal, often times inducing corrosion. Corrosion isn’t only an issue with metals, although it’s the main financial issue (think about all the drain pipes in the world!). There’s concerns about microbial induced corrosion of concrete and even research experiments done on the levels of biodeterioration in history Archives (2). While academically interesting, I beg you to prevent me the opportunity to do such research. It’s much easier and cheaper to keep your home and ventilation system clean than it is to bring in Environmental Microbiologists, Toxicologists, Epidemiologists, and Mechanical Engineers to pinpoint your issues. 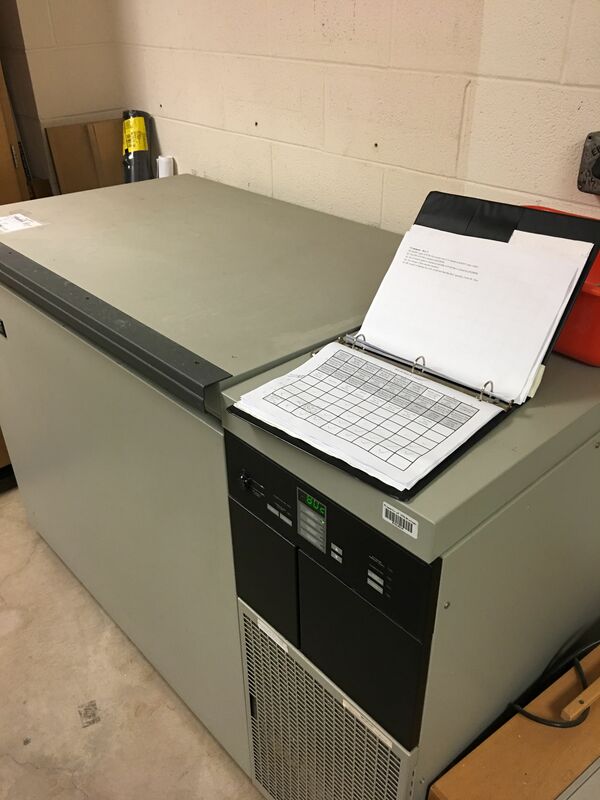 Pictured above is a -80C deep freezer, This is where organisms can be kept at such cold temperatures that no metabolic products occur. Borrego, Sofia. Determination of Indoor Air Quality in Archives and Biodeterioration of the Documentary Heritage. International Scholarly Research Network. ISRN Microbiology. Volume 2012, Article ID 680598.